Flat or drum? Dry or wet rub? Hot, medium or mild? Sweet or sour? Traditional or creative? These are just a handful of questions culinary students from DeKalb County School District (DCSD) answered on Friday, November 2 as part of the district’s second annual DCSD Wingfest, sponsored by the Career Technical & Agricultural Education (CTAE) department. 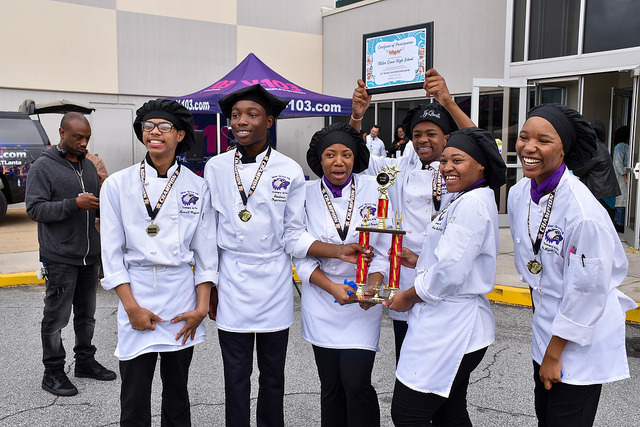 For the entire month of October, culinary students at 10 high schools—Warren Tech, Miller Grove, Clarkston, Columbia, Tucker, McNair, Arabia Mountain, Lakeside, Redan and Towers—have fired up grills, mixed spices, and worked as creative units to concoct the perfect chicken wing. On November 2, teams from the schools came together at the Robert R. Freeman Administrative & Instructional Complex to test their results. DCSD staff tried one wing from each school before voting for their top three. According to Dr. Delmas Watkins, CTAE director for DCSD, Wingfest is an opportunity for students to not just test their cooking skills, but also skills involving customer service, management, crisis management, presentation, customer satisfaction. Some preferred Clarkston High’s creative approach with the “Fire & Ice” chicken wing, which paired a heavily spiced wing with a scoop of sorbet. 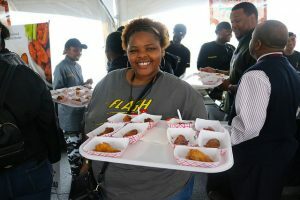 Others preferred Arabia Mountain and Tucker’s traditional approach to wings, which gifted eaters’ taste buds with unique-but-familiar sauces. While considerably bold, Clarkston claimed last year’s trophy through sheer creativity and the perfect pairing of flavors. In the end, Miller Grove High claimed the gold medal, with Columbia placing second and Arabia Mountain placing third. For Watkins, the event is a unique opportunity for everyone at the DCSD central office to celebrate student talent and indulge.